Thanks to their many years of experience in the furniture-making industry, Radaelli Angelo s.a.s. of Varano Brianza (province of Milan) can now boast a leading position in the enhancement of sections and coverings for interior decoration. Over the years the company has invested heavily in research in order to develop innovative solutions such as Dip Print, an example of a three- dimensional decorative technology by means of which special pigments applied to a water-soluble backing can then be transferred to artefacts. Thanks to this technology, Radaelli are able to reproduce many different designs such as those of the wood of various species of trees, of marble and granite, patterns and geometrical motifs accurately. The process also includes finishing of the artefacts with a clear varnish that improves their appearance and ensures a long useful life. 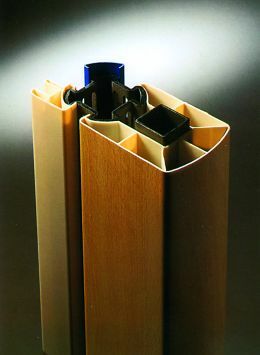 One of the features that architects working both on board super-yachts and on firm land in settings requiring high aesthetic standards appreciate about the Dip Print technology is the continuity and uniformity of the finished surface, whether it is made of iron, aluminium, brass, extruded PVC, MDF, polyurethane or wood. The company's technical and sales personnel are able to assist each single customer, accompanying them through the design stage, the creation of specimens and industrial production, ensuring a high level of production flexibility and limited delivery times. Another activity due to which Radaelli stand out on the market concerns their coverings, that can be made of veneer, PVC, printed paper or laminated materials. 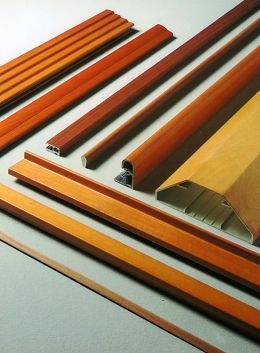 The systems used by Radaellli enable to treat sections made of wood, chipboard, MDF, extruded aluminium or stiff thermoplastic materials to be enhanced by covering them with materials such as pre-painted and finished flexible printed paper with substances varying from 60 to 120 g/sq.m., paper impregnated with polyester resins from 0.20 to 0.33 mm thick, decorated or plain calendered PVC film from 0.15 to 0.40 mm thick or thermoflexible laminated materials from 0.12 to 0.20 mm thick. The covering is attached to the surface by means of heat-softened or polyurethane-based adhesives capable of ensuring very high adhesive strength and a long useful life. The company's catalogue is up-dated constantly on the basis of the offering of patterns and colours to meet the needs of a vast and varied customer base and so as to ensure top quality. For further information contact Radaelli Angelo s.a.s., Via Comasina 111, 20050 Verano Brianza (MI) - Italy; phone 0039 0362 2601, fax 0039 0362 8260210; web site www.radaelliangelo.com.